The Bugle is delivered door to door to residences in north and south St. Anthony Park, Falcon Heights, Lauderdale and Como Park. Delivery takes place Tuesdays, Wednesdays and Thursdays, usually during the third or fourth week of the month. 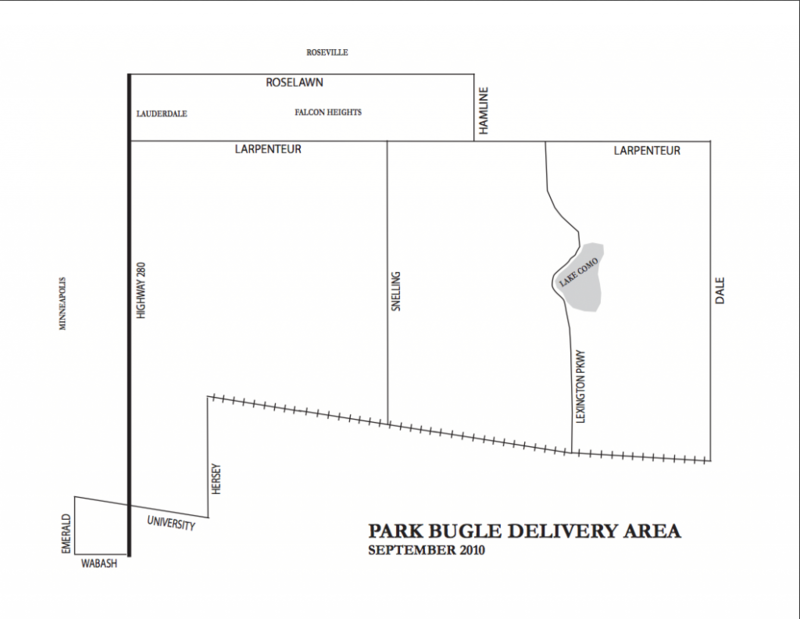 The Park Bugle is delivered to residences and business drop-sites in St. Anthony Park, Lauderdale, Falcon Heights, and Como Park. It takes 2-3 days for the deliveries to be completed. Delivery begins on Tuesdays of delivery weeks and should be complete by Thursday of that week. If you were missed in our delivery, you can find a copy at a number of libraries and businesses in the Bugle’s distribution area. Agharta Records, 2512 University Ave. W.
All Season’s Cleaners, 2234 Carter Ave.
Cafe 99, 1552 Como Ave.
Children’s Home Society, 1605 Eustis St.
Colossal Cafe, 2315 Como Ave.
District 10 office, 1224 N. Lexington Parkway. Dogwood Coffee Bar, 825 Carleton St.
Falcon Heights City Hall, 2077 Larpenteur Ave.
Finnish Bistro, 2264 Como Ave.
Hampden Park Co-op, 928 Raymond Ave.
Health Partners, 2500 Como Ave.
International Institute, 1694 Como Ave.
Key’s Restaurant, 767 Raymond Ave.
Lauderdale City Hall, 1891 Walnut St.
Little Wine Shoppe, 2236 Carter Ave.
Lori’s Coffehouse, 1441 Cleveland Ave.
Luther Seminary Olson Campus Center, 1490 Fulham St.
Lyngblomsten Home, 1415 Almond Ave.
MidModMen+Friends, 2401 University Ave. W.
Nelson Cheese Shop, 1562 Como Ave.
Noll Hardware, 789 Raymond Ave.
Park Service, 2277 Como Ave.
Healing Elements, 2290 Como Ave.
Roseville Library, 2180 Hamline Ave. Salon in the Park, 2311 Como Ave.
Schneider Drug, 3400 University Ave. Speedy Market, 2310 Como Ave.
St. Anthony Park Library, 2245 Como Ave.
St. Anthony Park Dental Arts, 2282 Como Ave.
St. Anthony Park Dental Care, 2278 Como Ave.
Sunrise Banks, 2171 University Ave. and 2300 Como Ave. Underground Music Cafe, 1579 Hamline Ave.
Urban Growler, 2325 Endicott St.
WORKHORSE Coffee Bar, 2399 University Ave.
tempus consequat. non nec libero. in eget quis, fringilla neque.